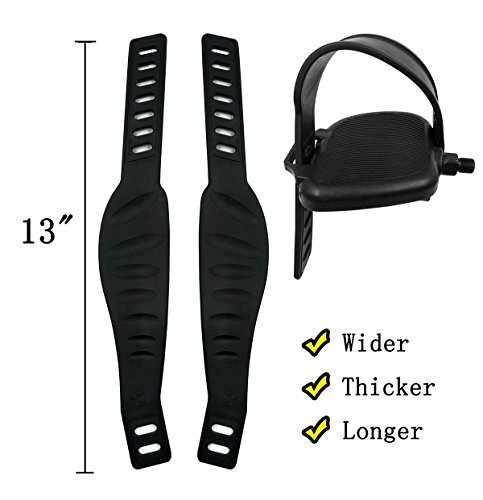 You must long for this enhanced exercise bike pedal straps. This one is adjustable and the max length is 33 cm (13 inches) that can fit on most foot type and most stationary bike. These strap is durable and tear resistance for it is made from rubber material. And the enhancement in length, width and thickness gives you more comfortable when you use it. It is made from rubber which has a good wear resistance and tear strength. The left and right is marked clearly that you would not be confused about it. This pedal strap is adjustable that you can adjust according to you needs. Our pedal strap is wider longer and thicker to makes you feel more comfortable while you do the exercise. The max length is 33 cm (13 inches) and max width is 5.7 cm (2.3 inches).It is designed to fits most stationary bike and exercise bikes. If you have any questions about this product by Being fun, contact us by completing and submitting the form below. If you are looking for a specif part number, please include it with your message.